We are finally in Iguazù Falls, on the border between Paraguay and Argentina. We reach our hostel Che Lagarto Suites at 8 am.It is a really good hostel, with an ensuite bathroom and a nice dorm of 4 beds. We share the room with Naomi, a nice Australian girl who has been travelling alone for a few months now. After a delicious breakfast (included in the price of about 12 euros per person per night), we take the bus that finally takes us to the famous Iguaçu Falls. These waterfalls are generated by the river Iguazú on the border between the Argentine province of Misiones and the Brazilian State of Paraná, declared a UNESCO World Heritage Site. We pay 13 euros for the entrance to the park from the Brazilian side. There is a short walking path in order to reach the falls. We finally have a sunny day to better enjoy this incredible landscape! Most of the waterfalls are located on the Argentine side, but from here you can get a better view especially of the Garganta del Diablo. The view from here is just amazing! It is easy to feel small and powerless in front of the majestic force of the waterfalls that surround us. The next day we decide to visit the falls from the Argentine border. Therefore we take a bus to cross the border and we reach the waterfalls at 1 pm (entry cost about 14 euros). Unfortunately, today is a rainy day again and it doesn't help at all. Indeed, we are soaking wet even though we wear a raincoat. It is very cold and some paths are dangerous because they are very slippery. Nevertheless, the view is still extraordinary! The Iguazù Falls are undoubtedly one of the most spectacular landscapes seen so far! We are now on the bus again, this time towards Florianopolis. It is freezing in here, as always on the buses in South America. You can see everywhere people equipped with blankets and pillows to face these long trips by bus. Indeed, here buses are the most popular means since the planes are too expensive. Therefore they use the 10-degree air conditioning to "sterilise" the buses during the usual 20-30 hours of travel. Luckily we have a sleeping bag because the journey takes around 15 hours. We are not far from Florianopolis and we can see on the way the advertisement of David Guetta and Gustavo Lima concerts. It gives us the idea of a young city. Actually, we notice a very high number of young people due to the numerous universities in this area. Florianopolis, indeed, is not only the capital of the state of Santa Catarina but is counted among the Brazilian cities with better quality of life and an index of human development. 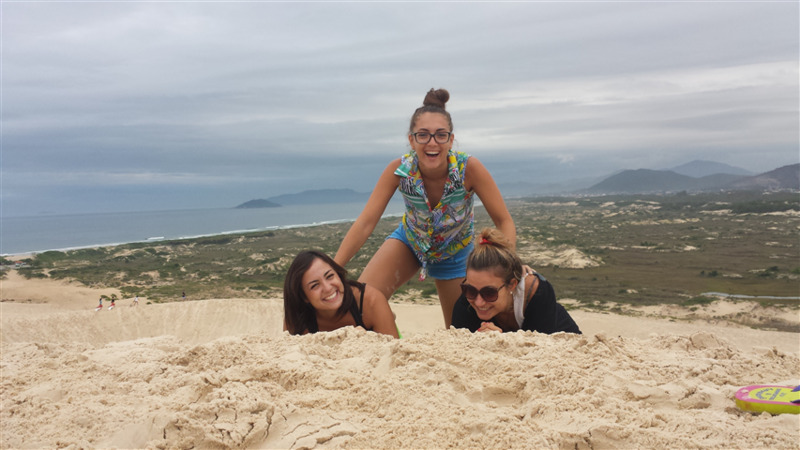 We reach our hostel (Che Lagarto) and go for a ride in the nearby Praia Mole beach. Shortly after it starts to rain and we stop for a hot tea at a beach bar. Here we have a chat with the waiter Lucas, a twenty-year-old boy who lives in his world of beaches, surf, nature and marijuana. After work, he invites us to join his friends in a hostel (Backpackers Sunset) where we can admire a beautiful sunset while drinking a beer in good company. In the evening we stop to eat sushi in a pub on the way back to the hostel. We are too tired to cook today! The next morning we go downtown to buy fresh seafood to prepare a delicious risotto. After lunch, we head towards Praia Joaquina, one of the most popular surfing beaches. It is also famous for its sand dunes on which you can do sandboard. It is a really nice contrast between the blue of the sea and the yellow of the sand dunes. We try to rent a car for the following day in order to visit the island and while asking around, we meet Roberto, an English-Italian guy who invites us to go for a drink with his Argentinian friend Leonardo. Since we cannot rent the car because of some issues with the credit card, we decide to visit the island by public transport and hitchhiking. Late in the evening, we meet the two guys and we go listen to some typical Brazilian music in a downtown pub. Around 2 am we go for a walk in another district frequented mainly by students, near Praia Joaquina. As soon as we arrive, however, we attend a police blitz in which they arrest a lot of persons in the square for drug dealing. Unfortunately, we are stuck for more than an hour because they end up inspecting all the cars. Luckily we are with Robi and Leo who are two really nice and funny guys. We stay in Florianopolis only 3 days but we immediately realize that the quality of life here is quite high. People are very hospitable and there are breathtaking beaches for all tastes and for any sport. Moreover, since it is a famous university city, it represents a great destination for many backpackers who decide to stop and work here for a few months before carrying on with their journey.